Boil potatoes with a pinch of salt. Remove the skin and mash the potatoes. Add 2 Tbsp. of wheat or all purpose flour, corn flour and a pinch of salt. Mix them well and make it into a dough. Divide the dough into shape and size of small golf ball. You may get 8 depending on the size of the potatoes used. Melt butter in a skillet, and then add 1 Tbsp. wheat or all purpose flour. Saute until the color changes to light brown. Stir in cup of milk. Mix well so that there are no lumps formed. Then add Kraft Shredded Cheese. Grind jalapeno and cilantro roughly and add to the hot mixture. Allow it to cool. This solidifies as it cool and would be ready to handle. Using the small dough ball, flatten it into a flat bread shape with your fingers. Scoop in a teaspoon of the cheese filling. Close the flat dough making it again into a ball with the filling. 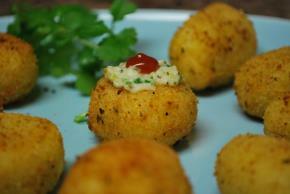 Roll these cheese filled balls on bread crumbs. Deep fry in medium heat oil.